1. Climb. If it makes you feel good to climb a mountain or run a marathon with cancer, fantastic. 2. Cry. If you cry yourself to sleep and cannot scrape your depressed head off the pillow in the morning, that’s pretty normal too. 3. Reality. Don’t believe the hype that we can choose whether or not cancer is going to get the best of us. Cancer is not an attitude. It is a disease. 5. Ask. Ask for help when you need it from people who are good at giving it. 6. Learn. Make educated choices while realizing there is no guarantee that the right choice will yield desirable results. 7. Love. Love those who support you and take a break from people who just don’t get what you are going through. 8. Science. Get constructively pissed off at the system, but stay curious about science. 10. Vulnerability. Create your own definition of strength and let it change as needed. For me, strength comes from recognizing that I am vulnerable. What are some cancer truths, or pointers, you would give to newly diagnosed patients? Are there any of mine that you disagree with? Know: Know you’re not crazy, hypersensitive, or different from anyone else who’s been punched by cancer if people’s insensitive, thoughtless, or simply ridiculous comments drive you up a wall! 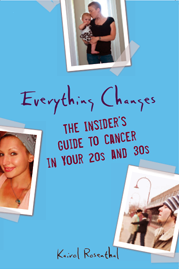 Also, want to give you a heads-up that I just talked w/Heidi at Planet Cancer because I’m beginning a series of blogs about young people and cancer to promote your book and add energy to our battlecry, and am thrilled that she’ll be promoting your book as well! You know she also thinks you’re a fabulous writer! this is such a helpful, thoughtful list. thanks for posting it! Thanks for the list and the posts. I really like Lori’s comment that people should know that they’re (we’re) not crazy!